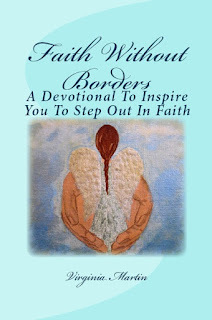 God recently put in my head to change the cover to the devotional I wrote, Faith Without Borders. The change was to make the book cover softer and more appealing. I am pleased, and I believe God is too, with the result. Part of the proceeds of the sale of the devotional benefit my local church. My plan is to do a study guide for the devotional titled, Walk In Faith, to be published in November, 2017. The study guide will go into each chapter more, and will have questions to prompt reflective thought about the topic of the chapter. I will have new bible verses and quotes for inspiration and encouragement. My plan is to hold a four to six week study at home once the guide is published. I have participated in the Women's Ministry at my local church as a co-facilitator for a few bible studies, and I find that I enjoy the fellowship and sharing of God's word.